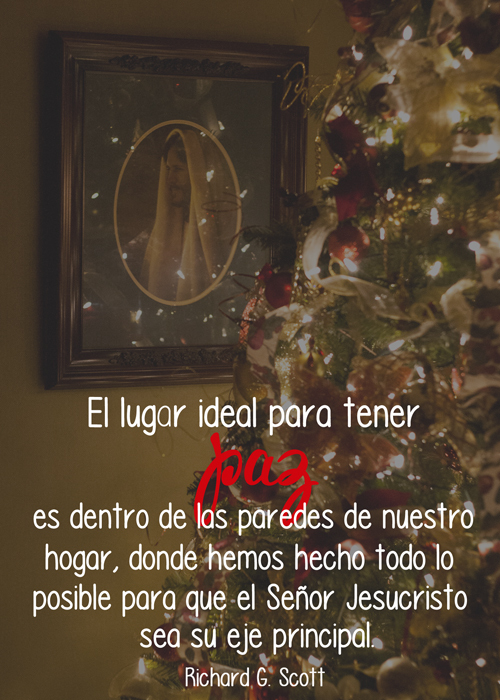 This month's Visiting Teaching Message is The Divine Mission of Jesus Christ: Prince of Peace. For me, it is a fitting end to the year since the word I chose to live by for 2014 is PEACE. Yesterday, I was asked to speak in Sacrament Meeting about preparing our hearts for the Savior. So I've been thinking about this topic quite a bit this week. I want to make sure that Christmas is not spent rushing around doing things in a huge frenzy. I want to find time to be still, to be quiet, and to honor The Reason for our celebration. The Prince of Peace. He must be the center of our home during this Christmas season, and always. That is how we will find true and lasting peace. 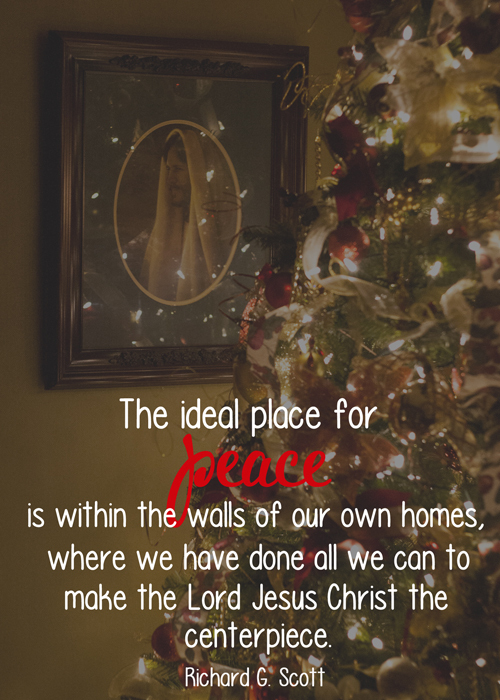 My printable this month uses a picture of my own home--my Christmas tree with a painting of Christ behind it. Something that will hopefully keep me grounded this holiday season. May you feel the peace of Christ this Christmas Season! What a great post! Thanks for reviewing all of those planners. I LOVE planners, but I get super picky when it comes down to picking one for myself. Your post definitely helped narrow down my list. Thanks for this post! I am going to look into the last two planners you posted. I have used the Home Executive Planner for the past two years and she has updated it so that there are 5 blank columns across the top, "weekly meals" in column 6, and "shopping list" in column 7. She got rid of the subheadings in the shopping list and it's just one long column now. The stickers are no longer LDS themed. The extra pages have probably changed as well. You would probably like the current format better, although there are still no dividers and I, like you, use paper clips for that purpose. I also want to look in to the new Simple Stories planners that come out this month. The downside to those is you have to use a 6x8 binder which might be too large for my purse, and I think it will end up being pricey. Here's one wish. I wish my calendar in my purse will automatically, electronically sync with the family calendar on the fridge! I use the family calendar the most, so that's my main priority. So many different pretty choices to choose from! Thanks so much! i have been stressing over which planner to try/buy this year and I so appreciate your comments and pics. I bought the Korean planner and am excited to give it a try! Why don;t you use a filofax or midori? I'm so glad! I hope you were able to find a good one for you. Happy New Year! Hope you found a good one for the new year. Oh, I hope you have fun with it! Happy New Year! I personally don't like filofax. I've flipped through them and they just wouldn't work for me. I've never looked at a midori. There are so many planners out there--it's impossible to try them all, isn't it? My favorite so far is definitely the Mom on the Go planner. I use a weekly plan ahead planner in a Franklin Covey compact size. I like the flexibility of ring bound, but need a small footprint. Admittedly I haven't yet had to balance kids' schedules as well as my own, but there's no way at all that I could have gotten through my senior year of college without the Original Student Planner from Polestar Calendars. I randomly stumbled across one in a bookstore my sophomore year and used them religiously ever since. Good things about it: The days are split into three categories (I think it's Assignments, Tests, and General, but I could be wrong), they have a decent number of blank pages (lined and unlined), and they have little tabs in the bottom corner that you can tear off to keep track of your place in the calendar. I swear there were some days that I only knew what day it was because of the tabs. Also, it follows the academic year (naturally). Bad things: my major complaint is that the extra pages are REALLY focused on student needs. Things like class schedule, major assignments, and midterm/final grades. I really only used the class schedule to note room number and teacher if it was new to me, but as a graduate I have zero use for those sections. I imagine that Polestar probably has other planners with the same pros and different cons. I could really write a novel about my feelings for this planner, so I'll just post a link and let everyone else decide for themselves! I have tried Erin Condren - cute, but heavy and I need to time block...not just sections of a day. I found Passion Planner www.passionplanner.com - I can't wait to get mine! Ever thought of trying a disc-bound system like Circa by Levenger or M by Staples Arc system? Fully customizable to what you need.